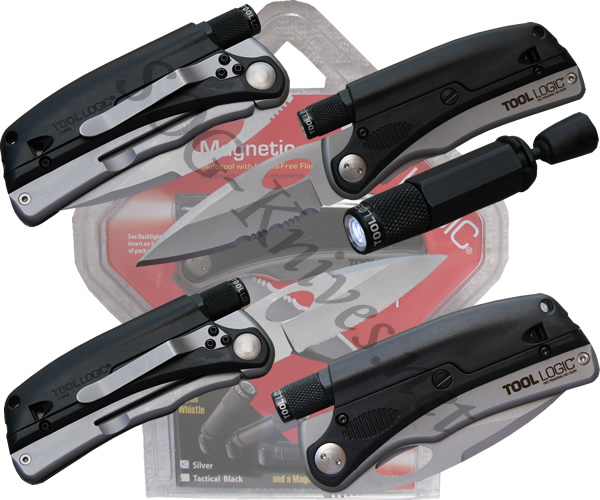 The Tool Logic SL Pro 1 model SLP1 has a magnetic hands-free LED light. This intense little light uses a built-in magnet to attach to metal objects. There is a ball joint that holds the light to the magnet, which allow you to aim the light on whatever you are working on. What is also neat is that the light can be turned on without remove it from the tool. This comes in handy when you want to use the whole knife as a flashlight. The knife blade is 3 inches long, partially serrated, and razor sharp. A whistle is built into the handle for emergencies. Own a Tool Logic SL Pro 1 Survival Tool SLP1? Tell us how you like it! Got a question? Ask! Somebody will answer!